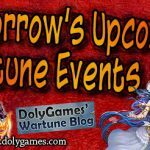 Hey everyone, in this article I share the Wartune Events 22 August 2017 (article + video). This event cycle is a good chance to do Holy Forge and upgrade Tattoos. The event chest Devil’s Code #2 finished. The new event chest is the Flaming Gem. 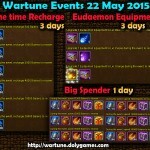 The event mini-item is Ancient Coins. Holy Forge – 3 days: Holy Forge X times. to receive rewards. 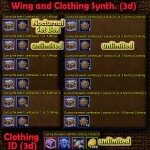 Tattoo & Holy Forge (Exchange) – 3 days: Exchange for Holy Forge related items, Equipment upgrade items and Advanced Henna. Special Exchange to fix the problem of Flags of Orders given out at wrong timing. Can exchange these into Ancient Coins. Please keep your mental issues to yourself. Your problems of loading are YOUR problems and not mine. And if you have problems with the owners of the game then go talk to them instead of coming here and insulting random honest people. Not my problem And another browser is also loaded. My laptop is ok.
And it is not my problem! 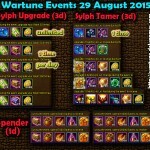 I am not the owner of Wartune, I am a blogger helping people. So keep your insults to yourself and if you have a problem with the owners of the game then go talk to them.